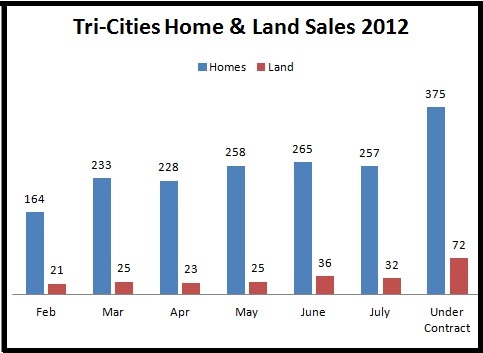 Home and land sales in the Tri-Cities remained stable & steady in July with 257 single family home sales and 32 land sales. In addition, 375 homes and 72 lots are currently under contract. We expect this steady real estate market to continue in the Tri-Cities as we move into fall. We had a busy July, showing houses to several new buyers, closing one of our listings, adding a new listing, and placing 7 houses under contract! We have 2 new listings coming up in mid-August so don’t forget to check our featured homes, they’re always updated and available on the right side bar of our website. Thank you to all our clients and friends for referring us…it’s the best compliment you could give!